2018 Iron Mine WORCS Results – Taylor Robert won again in the 2018 Rocky Mountain ATV-MC WORCS Championship. 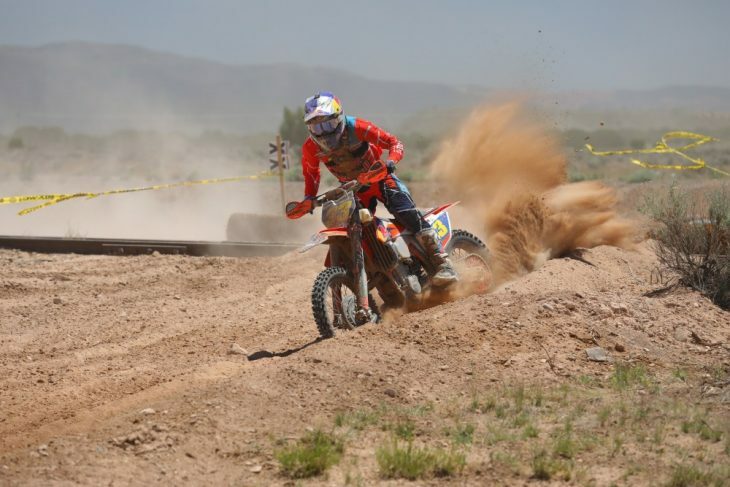 The latest round in Cedar City, Utah, May 27, saw Roberts come out on top at the Iron Mine after battling dust early on, but once he passed for the lead, it was clear sailing for the FMF/KTM Off-Road Team rider. Roberts had to chase down Zach Bell off the start but it was a tough job because of the dry and dusty conditions and, not to mention, that Bell was flat out hauling. On the second lap, Robert caught and passed Bell and held on for the win, crossing the finish line nearly 45 seconds ahead of the Husqvarna rider, Bell. After five rounds and missing two of them, Robert is now fourth in the championship, 12 points behind third-place Bell, and 32 points behind leader Giacomo Redondi, who was third in Utah, about 10 seconds behind Bell. Defending champion Gary Sutherlin (Suzuki) was fourth, and Eric Yorba (KTM) was fifth. Austin Serpa (KTM) won the Pro 2 class with room to spare over Tallon LaFountaine (Husqvarna) and Mitch Anderson (KTM). Clayton Hengeveld (Kawasaki) was fourth and Kyle Mercier (KTM) was fifth. In Pro 2 Lites, Colline Elliott (Yamaha) took the checkered flag in first place approximately 25 seconds anead of Zane Roberts (Husqvarna). Spenser Wilton (KTM) was third.